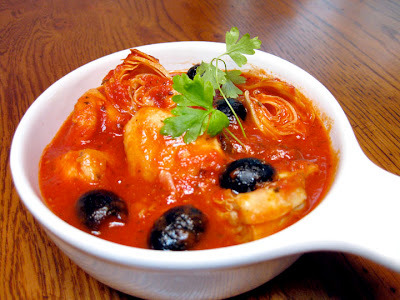 When I decided to make this dish, I was thinking of a chicken cacciatore that I used to get from a local supermarket. They would make it with big chunks of white breast meat, all the colors of bell peppers and lots of whole garlic cloves. It was delicious. Since I was making this for my mom, I decided to leave out the peppers because they don't agree with her. Because we both love artichokes and olives, I decided to sub them for the peppers. As a matter of fact, my mom makes a chicken and artichoke dish very similar to this, only without the sauce. Since I had a jar of sauce that needed to be used, I whipped this up. It is really good over pasta or you could eat it as is, with a big piece of Italian bread for mopping up the sauce. Add the flour, garlic powder and paprika to a large ziplock bag. Season the chicken pieces with the salt and pepper and add them to the flour in the bag. Shake the chicken to coat all the pieces. Remove from bag and shake off excess flour and set aside. Heat one tablespoon of oil and rosemary sprigs on low heat in large dutch oven or large deep skillet for about 5 minutes. Add the olives and artichokes cook for another 5 minutes. Remove the mixture from the pan with a slotted spoon to a bowl and add the remaining olive oil to the pan. Turn the heat up to medium/high and add chicken pieces. Brown the chicken on all sides and de-glaze the pan with the wine. When the wine evaporates, add the chicken broth and sauce. Add the artichoke mixture back to the pan and stir to combine. Lower the heat, and simmer slowly for about 20-25 minutes. Remove and disgard the rosemary sprigs. Serve over pasta or with Italian bread. This looks absolutely delicious! 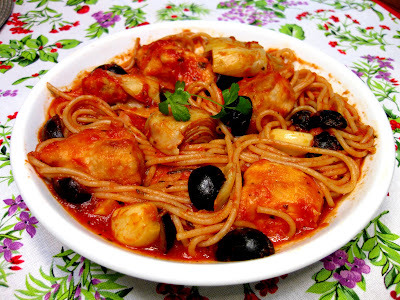 I love chicken cacciatore, so I know that I'd love this dish. Great creation! Mmm, oh yes. I love olives and artichokies. Looks spectacular! Love it. I always call this dish "Maria pasta" since no one made it as good as my SIL, Maria. Thanks for reminding me how much I have missed it. It looks wonderful! Love the combination of ingredients...artichokes...olives...yummie! The pictures look great! Really translate the taste of the dish. Wow. I bet there is so much flavor oozing from that dish. What a great idea to add the artichokes. I may give it a try using a vegetarian chicken substitute. That looks fantastic -- a hearty, healthy and delicious dinner! your site is really nice and great. its a very informative site. i have added your site into my this site Pumpkin Pie Recipes. Recipes into your nice site. i hope you will add my site into your nice site. ps- jicama is a root that's common in mexican cuisine. Crisp, crunchy, mildly sweet, it's refreshing and a great source of fiber, vit c and water :) i should've linked to the post where i tlaked about it! I love artichokes, I always have a bag of them in the freezer. This looks great! That dish looks delicious! a wonderful combo! absolutely delish. i'd say those artichokes are a good sub for the pepper. such a hearty dish. I wish I loved artichokes! This sounds delish! I am not a huge fan of artichokes by themselves, but love them in dishes - yum! aw man this sounds like my kind of dish! Love the flavors!